It’s the bond with Lightning that really brings Serah and Hope together. It’s so natural that they would become friends, that they would have an understanding of one another in their shared miss of such an important figure in their life, that it doesn’t matter that their shared condolence and grief and that the building blocks of their relationship takes place off screen. Of course they would come to matter to each other - the two of them shared a sibling bond before they even got to know one another. 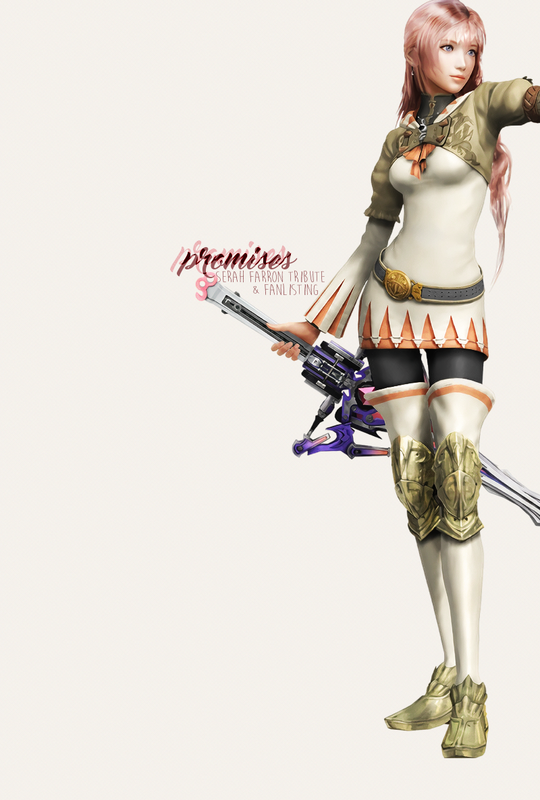 That care might have been born from Lightning, but Hope genuinely cherishes Serah as a person. Serah becomes a symbol of Hope’s hopes (ha) almost - though he’s fated to walk the slower path and do things from the sidelines, it’s Serah that will put his plans to action and maybe get everyone he cares about back. He has the way, but Serah has the means to mould the future, to see the results of his ideas and untangle them where necessary. She’s a fixer, just like him. Hope is the one that deeply misses those they have lost after Ragnarok and never really accepts it as true, just as Serah never did. It’s an excitement, almost, because Hope is scientific and now it’s not just a possibility - it can happen. They can get the people back that they care about. If Lightning can come back, maybe Vanille and Fang can; and if they can come back, then maybe he can also find his mother. Serah and Hope both know a lot about unfair loss. Hope just has a habit of caring for people too much before he inevitably loses them. This attachment is unsurprising. He might start out as a child, but he’s also a civilian, too. Hope’s reaction when he finds Serah ten years AF is a big indicator of how much he actually cares about her individually. Immediately after the Purge, Serah is a figure of blame to Hope, just a name - then he comes to know her through Lightning’s mistakes. He comes to know her when he offers Serah the survival knife at the base of the pillar when Lightning vanishes. That offering, in the rewritten timeline, is their first interaction. It’s their first step, and an incredibly important step, because Hope gives up a symbol of his relationship with Light to Serah because he knows who gave that knife to Lightning in the first place. Everything after that is conjecture. And then, after ten years, Hope sees Serah again and he’s overjoyed to see her. She’s here, he’s incredibly happy about it and he’s tactile, taking her hands and, well. Hope has never been a touchy-feely character. He’s quite withdrawn. But for Serah, he’s a perfect gentleman and greets her warmly, offers her a hand up a step, and smiles. Serah is equally happy to see him, and it’s so nice. Their relationship is incredibly solid and only built up from there. No matter what Serah does, Hope is always her not-so little brother. Even if that means shouting at him through time that his machines are driving her nuts. Honestly, because it’s Hope, he would understand when one of his sister figures is busy yelling at him in an oracle drive that maybe he should scrap this plan, because Farrons are scary when they’re mad. Lightning Returns focuses a lot on closing the narrative between Lightning and Hope, but this is just a matter of prioritising certain relationships with certain characters - Serah and Hope don’t make the cut. However, the easy route would have been to make Serah a substitute for Hope’s feelings about Lightning, but she’s not. She might be an extension of her, but she’s equally as important, and their relationship is uniquely portrayed over the course of XIII-2. They’re both the smart cookies, those incredibly rooted in wisdom and patience and the two that leave behind their own legacies - even if Hope’s is an actual physical world, and Serah’s is the gift of the world itself. And when Serah dies, Hope is ruined, because now he truly has lost everyone he cares about.